We reject the narrative that young people are apathetic. We are invested in a just transition #forourfuture. The Just Transition Working Group’s year-long Solutions Tour brought the language of the just transition directly to Kentucky’s youth, and invited them to weigh in on popular solutions through our Solutions Survey. Now, we’ve compiled the results of that survey into one report that summarize a year’s worth of conversations. Read the report and learn what KY youth need for a just transition. The Solutions Survey was intended to provide a youth perspective to inform our future just transition projects and to allow us to better advocate for community needs when meeting with decision-makers. 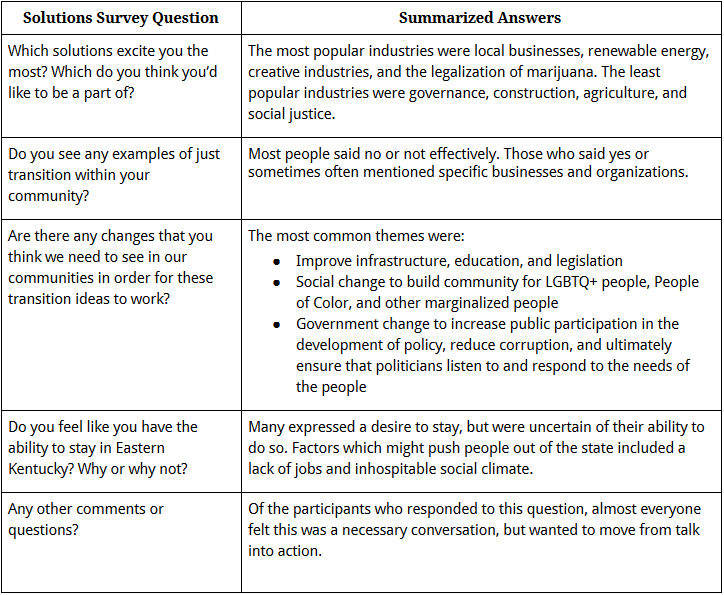 The questions and their most common answers are represented in the table below. Any solution that doesn’t address the root causes of these issues is a false solution that only moves the problem to another (usually marginalized) community. We can say that any real solution will require the voices of young people, because our futures are at stake. KSEC’s membership and the young people who took the Solutions Survey identified unmet needs in three major areas: meaningful employment, infrastructure and access, and government accountability. To join the working group or find out more about our latest projects, please reach out to Caci Gibson (they/them), KSEC's Eastern Kentucky Organizer at cacigibson94@gmail.com or 1-606-231-6803.